Astronomers using NASA’s Hubble Space Telescope assembled this Hubble Ultra Deep Field 2014 photo. NASA's Hubble Space Telescope holds the world record for peering farther into deep space than any other telescope of its time. It has imaged some of the most distant galaxies ever observed, allowing the telescope to look back in time to when the universe was in its infancy. This image, called the Hubble Ultra Deep Field, offers a core sample of the deep universe with diverse galaxies of various ages, sizes, shapes and colors. Close-up images of galaxies in Hubble's Ultra Deep Field image divulge the dramas that happen constantly in the Universe. This composite image of Galaxy HUDF-JD2 blends a visible-light photo from the Hubble Space Telescope with an infrared snapshot from the Spitzer Space Telescope. 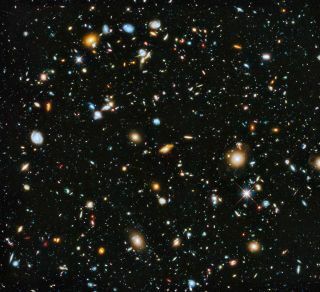 An image of the Hubble Ultra Deep Field released in 2004. The images taken in the Ultra Deep Field result from exposure time of over 11 days between Sep. 24, 2003 and Jan. 16, 2004. Over 2 billion light-years from earth, these two galaxies begin the process of merging into one. The mosaic displays a sampling of 36 young galaxies merging with other galaxies. The cosmic tadpoles get their name from the unique knot and tail shape. Read the full story here. A close-up from the Hubble Ultra Deep Field image, Galaxy UDFj-39546284, a faint reddish blob, is believed to be the most distant galaxy at more than 13 billion light-years from Earth. Read the full story here. The area between Ursa Major and Boötes, known as the Extended Groth Strip, as imaged by the Hubble Space Telescope. These distant galaxies — over 6 billion light-years away — are merging together. The region of space within the Fornax constellation, seen in the Hubble Ultra Deep Field, contains an estimated 10,000 galaxies.